Don't want to waste time on subject reviews because you've been there, done that? Pressed for time, or yearning for tips and strategies that will make it easier to succeed on the SAT? Then reach for Barron's SAT Express. You'll find all the tips, tactics, and strategies you need to ace the test, including:An introduction to the SAT: When it's given, how it's scored, and when to take itPart One: Seeing the logic, balance, and details in English Part Two: The Reading Test: learning vocabulary, matching your questions, staying focused attacking special question types, plus reading, writing, and planning the optional essay Part Three: The Math Test: Calculator and Non-Calculator Sections, Algebra, Geometry, Trigonometry, Math in the Real World, Know General Math Tactics first, Practice Specific Types of Math Problems Second Part Four: Putting it All Together. 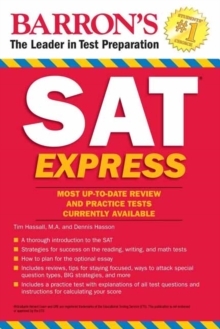 Includes a practice test with explanations of practice test questions and instructions for calculating your score SAT Express is the fastest route to the highest score. This completely new book offers a laser-like focus on concepts and strategies, giving you the edge you need over other test-takers. Includes appendixes of BIG strategies and Important Math Tactics.